There are many different methods of transferring a lettering design to fabric...but deciding which one I want to use depends on the variables of the situation. 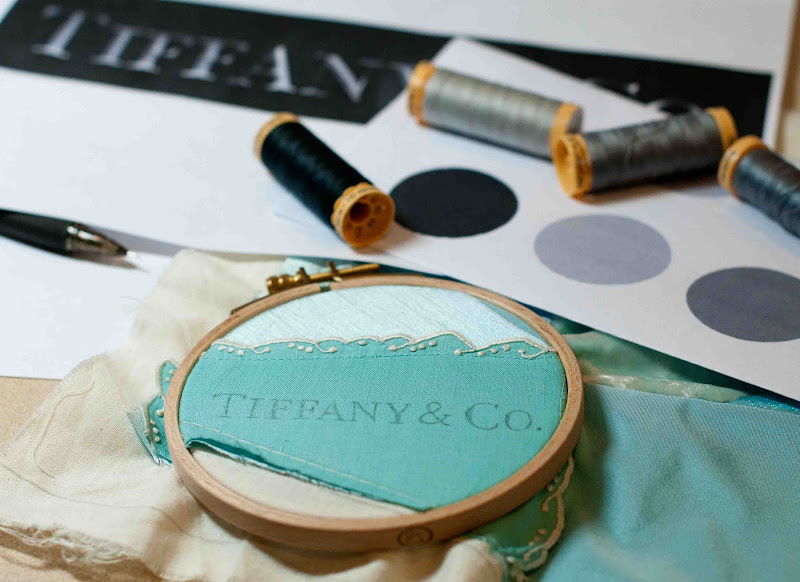 I have begun again to work on my Breakfast at Tiffany's CQ block and wanted to transfer the store logo to my pieced block. I couldn't trace the design through the fabric at the window since the pieced fabrics were too thick to see through. My second thought was to use the tissue paper transfer method but after I traced the letters, I realized my lettering was a little wonky and stitching over it was likely to make it wonkier (and take forever). 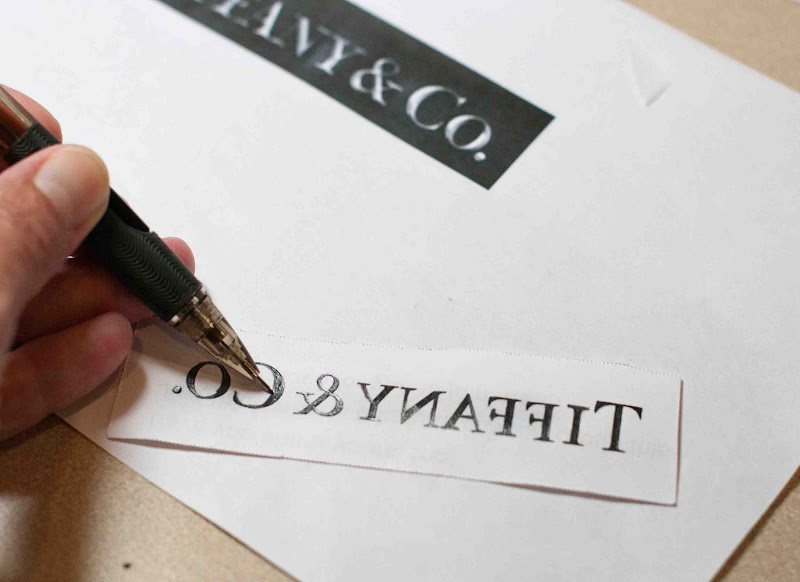 That's when I decided to print out the logo mirror image (rotate image>flip horizontal in PS) and coat the lettering with a thick layer of graphite pencil. I find if I use a 0.5mm mechanical pencil, my lines remain precise. I then placed the graphite-coated lettering onto my block and, holding it tightly under tension so the paper doesn't shift, I burnish over the the letters pressing hard so that the pencil transfers to the fabric. The pic doesn't show me holding the paper firmly because I can't hold the camera and hold the paper tightly. After I lifted away the paper, I took my pencil and lightly went back over all the areas to deepen the transfer. IMHO, this backwards pencil transfer method beats a carbon transfer method because it allows me to be much more precise. Now I'm ready to start lettering. I converted my color photo to black and white and used that photo to create the color palette for my lettering. This is going to be fun to watch. Do you have enough jewels? That's the coolest "tip" I've seen in a long time! I'm gonna link you so my followers will check this out too! Thanks so much for the technique! Can't wait to seee the stitching...good way to trnsfer. I'd not have thought that technique would be clear enough - it's good to add it to the repertoire. 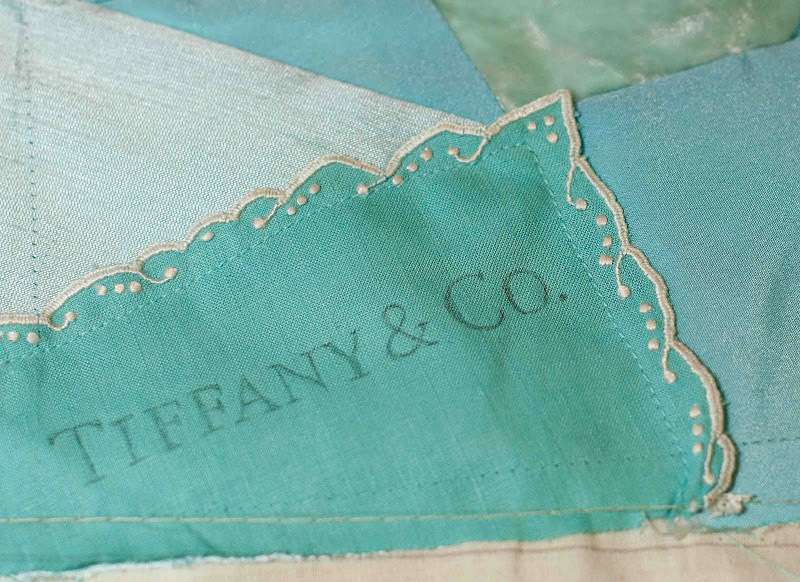 Great tip and the fabric you transferrred to, is the perfect Tiffany shade of blue! Wow this is such useful info Susan. Thanks so much. I've always struggled with lettering. A very clever idea. Thanks for sharing.ps Kathy sent me over. 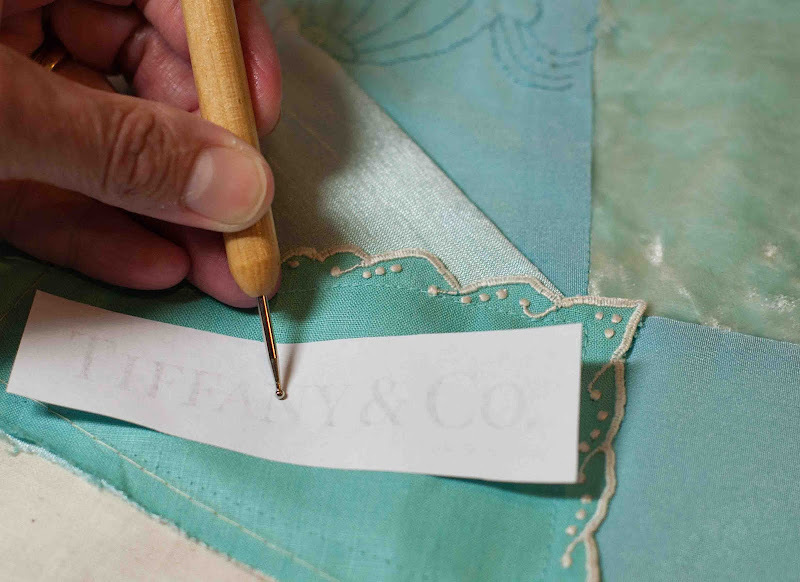 Susan- I love the aqua AND the letters- I can hardly wait to see this project! I know it will be fabulous! I am amazed how well that technique worked, I did not think that it would be that crisp and clear! First, let me say that your blog is just WONDERFUL, you are so talented, and I always look forward to your posts. However -- I think you've just violated their logo copyright. I know that my company would ask you to take the post down. Here's hoping not.